Teen movies have come a long way from early examples like Rebel Without a Cause and West Side Story. There were the slasher films of the late 70s and early 80s, movies like Halloween, Friday the 13th, and A Nightmare on Elm Street. Around the same time, a young filmmaker by the name of John Hughes began making movies about teens that blended drama, comedy, and romance. As nuanced as his portraits of teen life were in films like Sixteen Candles and Pretty in Pink, their source of conflict, and thus the major focus, was always the main character’s romantic relationships. 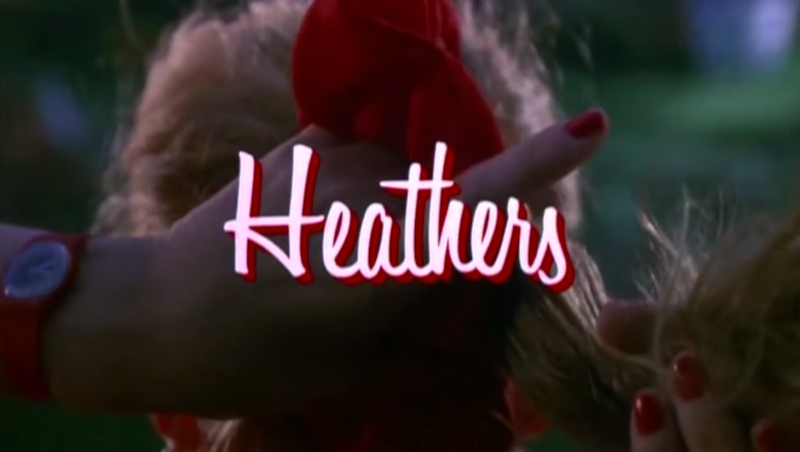 But in 1988, a sharp-witted movie titled Heathers came along and turned all that on its head. 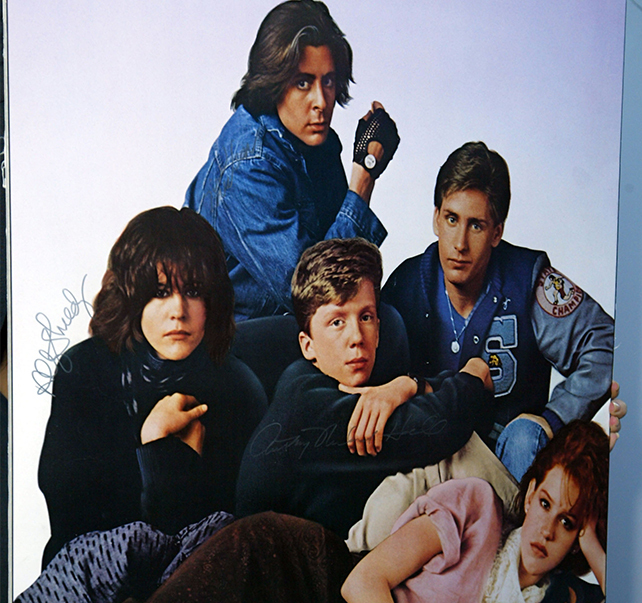 Rather than a soft-focus, soft-hearted take on the teen experience like The Breakfast Club, it wrapped up some of the grittier realities of teen life in a glossy (and hilarious) package—including toxic relationships, class awareness, familial indifference, cliques, extreme emotional highs and lows, and the unfortunate truth that sometimes your best friends are also your worst enemies. Heathers and its emphasis on cliques and friendship went on to have a major influence on two of the most popular teen films that followed it into the 90s and 2000s: Clueless and Mean Girls. Heathers was a revisionist film, deconstructing and skewering the conventions of teen films that had come before—especially the aforementioned John Hughes-helmed entries into the genre. It’s an important movie for the way it looks at cliques and how popularity affects females specifically, and their friendships. The focuses of the film are the four most popular girls at Westerburg High School: three Heathers and one Veronica, our protagonist, played by a young Winona Ryder. Veronica hates her friends, particularly Heather Chandler, who is the only one who seems to match her intellectually. Veronica’s boyfriend J.D. (portrayed by Christian Slater) steers Veronica into poisoning Heather Chandler and making it look like a suicide, which sets off a boost in popularity of teen suicide as an issue and practice, as well as more murders perpetrated largely by J.D. After her involvement in Heather Chandler’s death, Veronica finds it increasingly difficult to interact with and relate to the two remaining Heathers, acknowledging that despite being her worst enemy, Heather Chandler was also her best friend. Her friends negotiate their friendship and popularity in different ways after the death as well, with Heather McNamara becoming more and more lost while Heather Duke adopts some of the more unsavory character traits of the deceased Heather Chandler. In the 90s, the teen genre built from films like Heathers and grew into a more postmodern take on the form, with more movies telling stories centered on female friendship. This was best exemplified in Clueless, but was also apparent in films like Jawbreaker (the most obvious Heathers imitator), horror entries like The Craft, and teen-centric period films like Mona Lisa Smile and All I Wanna Do. The influence of both Heathers and Clueless reached into the 21st century with Mean Girls—coincidentally (or not) directed by Mark Waters, brother to the writer of Heathers, Daniel Waters. At a time when teens are struggling to establish a sense of identity, social hierarchies become extremely important to them: find a place within the social hierarchy, and identity is guaranteed. This is where cliques come in. They’re important because they’re supposed to work together like puzzle pieces, fulfilling different roles within the social structure of the high school. In Heathers, Clueless, and Mean Girls, we are introduced to the trope of the “anthropology shot,” which is a quick way for the audience to understand the cliques or social groups that populate the film’s world. This type of shot typically occurs in the high school cafeteria, the only place where all the different groups would be together at once. 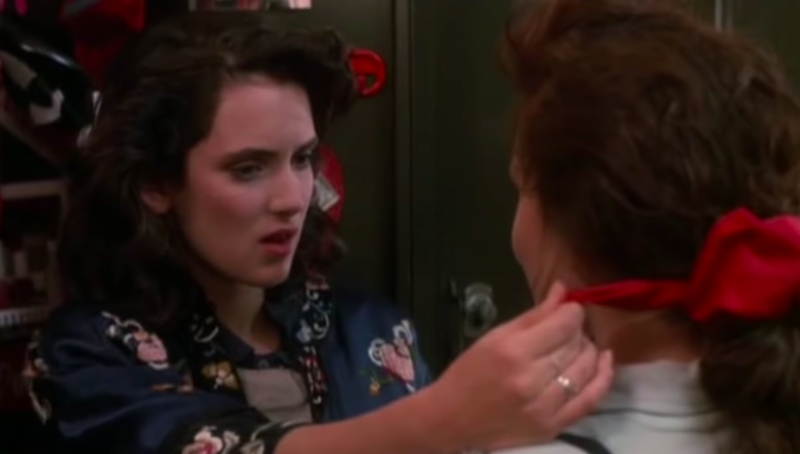 In Heathers, we see it when Heather Chandler conducts the lunchtime poll in the cafeteria and Veronica encourages her not to just ask the same people she normally talks to. In “anthropology shots” like this, plot devices like the lunchtime poll provide an opportunity for our characters to interact with people in different social groups without transgressing the boundaries between the groups. 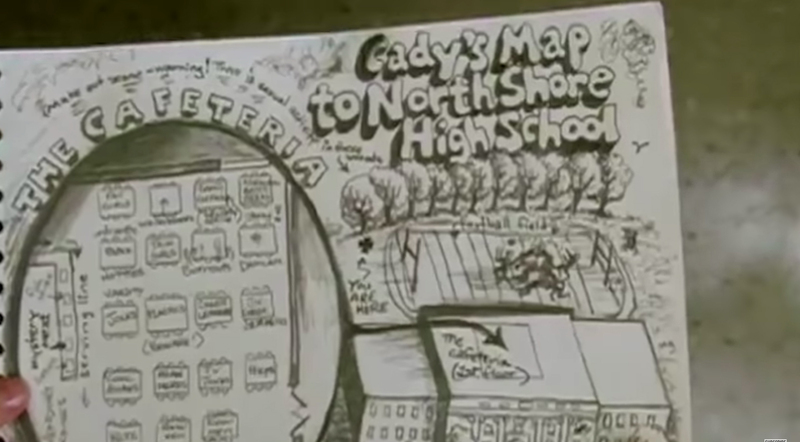 The lunchtime poll is briefly referenced in Mean Girls, and the main character, Cady Herron, is also given a “cheat sheet” by her friends Janis and Damian as a way for her to navigate the high school, complete with a map of where every clique sits in the cafeteria. Aside from the clear divisions of space, what we notice in these films is the difference in dress between social groups, which further serves to reinforce the social structure. In Clueless, this plays out as Cher, Dionne, and Tai walk in the open air campus between classes, pointing out the students in glasses and plaid who produce the school’s TV station, the “Persian mafia,” in leather jackets and on cell phones, and the school’s popular boys, who either dress in sportswear or button-up shirts with cardigans. These types of rules regarding dress within a social group are also an important part of Mean Girls. When she is inducted into “the Plastics” (the popular girls), Cady is given a list of the rules—everyone must wear pink on Wednesdays, no wearing a tank top two days in a row, jeans and track pants are only worn on Friday, and so on—all of which have to do with the way the group dresses. Regina George, as the leader of the group, is clearly the creator of these rules, which she acknowledges later in the film when she is forced to leave the Plastics table for wearing sweatpants. These rules are meant to uphold a social structure where Regina serves as leader. As such, her breaking the rules is damaging to that structure, the same as if anyone else in the clique had done it. Similar rules, unspoken and otherwise, exist in Heathers, mostly in its unique use of color, which begins in the very first scene. Each of the four members of the core clique has their own signature color—the leader, Heather Chandler, wears fiery red; Heather Duke, her underling, wears green, the color of envy; and Heather McNamara, the weakest of the four, wears yellow, as in “yellow-bellied.” Their fourth, the miserable Veronica Sawyer, wears blue. When Heather Chandler dies, Heather Duke takes her place, inheriting Chandler’s signature red scrunchie and shedding her green clothing. These rules tie the clique together, but at the end of the film, Veronica, finally sick enough of the group to blow it up (not literally, as her boyfriend intended), snatches the scrunchie and pursues friendship with other girls, specifically ones not named Heather. These films exist in “Girl World,” a phrase borrowed from Mean Girls. It’s a time between childhood and adulthood, where teen girls grip tightly onto what power they have in a world that affords them relatively little. They form connections with each other and, in those connections, work through the stereotypical trappings of femininity—fashion, shopping, gossip, and makeovers among them. While this period allows females to experiment with power and leadership, this is not to say it confronts or offers a solution to the problems that they face. A problematic aspect of many of these films is the representation of female power through a depiction of female friendship that is inherently competitive and cruel. While this is touched upon very lightly in Clueless through Tai’s turn against Cher and the character of Amber, it is much more present in Heathersand Mean Girls. However, this dark element also challenges a potentially harmful idealization of female friendship. Idealization can lead to an overly sentimental portrayal of friendship that discounts the autonomy of the female characters. The films included here manage to portray feminine relatedness and connection unsentimentally, allowing the characters to feel and express real emotions like anger, jealousy, distress, and aggressiveness. The cycle of films examined here all attempted to parody the conventions of the teen film genre, but through their similarities and the creation of their own set of tropes (the anthropology shot, the makeover montage, etc.) they became examples of a new type within the genre to be parodied themselves. In each film, the difficulty of being a teenager is complicated by close female friendships, social structures, and issues of class and status. 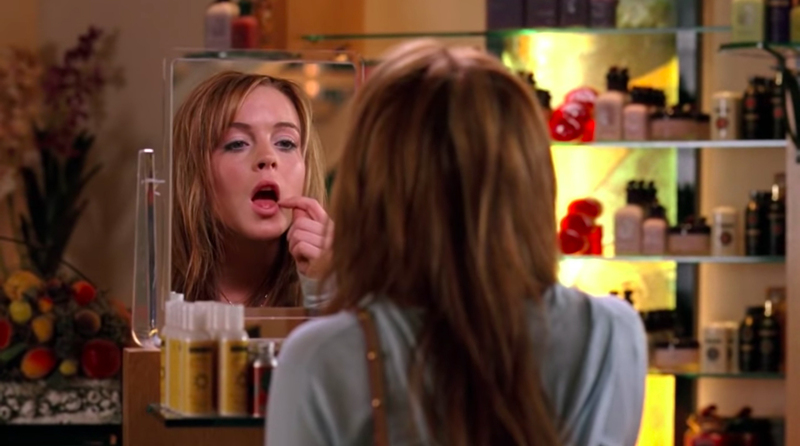 While films like Heathers and Mean Girls are more interested in heavily satirizing the dark side of female friendship and power as it occurs in a high school setting, their depiction of the characters’ performances of identity is as nuanced as the subtler parody found in Clueless. While they have much in common, each film retains a unique take on what it means to be a teenage girl and the crucial role that friendship plays in the lives of young women.